The Bank of Papua New Guinea released their Monthly Economic Report for November 2016 at the start of this month (see here). This is a useful update on some key economic indicators. An earlier version of this blog focused on an apparent dramatic drop in foreign exchange reserves in September, and a missing report. However, the Bank of PNG has now clarified that the end of September figures in the initial reports were incorrect and the September MER has been put back onto the website. The decline in foreign exchange reserves continues indicating the pressure on the foreign exchange market despite rationing. After a small recovery earlier in the year, the Employment Index declined marginally by 0.7 per cent, indicating the slow pace of economic recovery. Average commodity prices declined by 1.22 per cent for the month (although things have improved since then). The Trade Weighted Index of PNG’s exchange rate started appreciating again from mid-2016 (the opposite of what should be happening to address PNG’s foreign exchange shortages). The inflation rate stayed at 6.8 per cent (so a higher rate than desirable, although fortunately not accelerating). Private sector credit grew by 9.6 per cent over the last 12 months – a very positive turnaround. As shown in the chart below, PNG’s international reserves have been declining fairly steadily for the last three years. 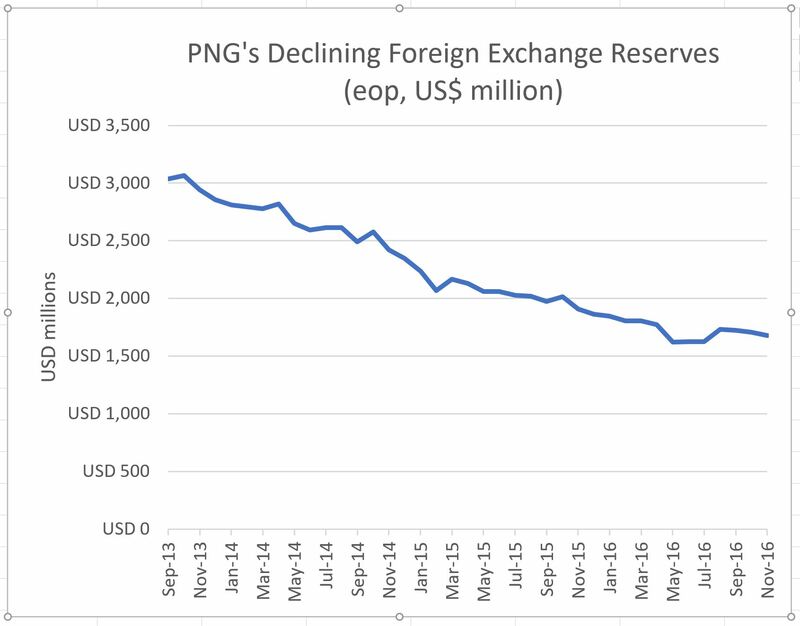 The decline represents nearly half of PNG’s reserves with a move from just over $US3 billion in October 2013 to $US1.7 billion in October 2016 – even after the Credit Suisse $US0.2 billion first tranche of its loan. 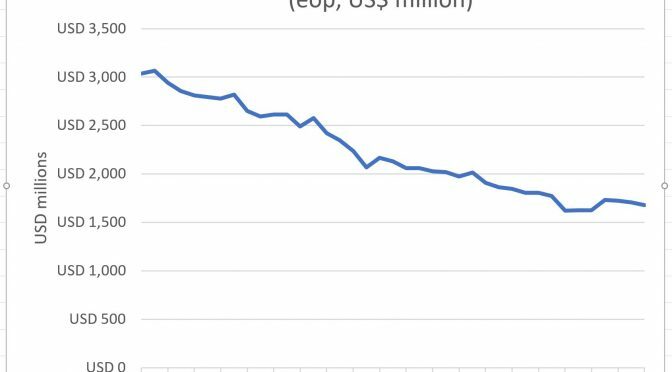 This significant decline was certainly unexpected at the time of the commencement of PNG LNG exports. The drought also had an impact. However, the combination of continuing foreign exchange shortfalls and falling reserves does indicate that the exchange rate is likely to be significantly above market levels. And as noted above, the overall foreign exchange rate between PNG and the rest of the world (called the Trade Weighted Index) – not just the US and Australia – has actually started to move even further away from likely market levels.